Part of our club’s mission is to “Play It Forward” in our community through outreach and service. Players and supporters put on their Blazers Gear and joined the Walk for Values on Saturday, October 6, at the NC State University. 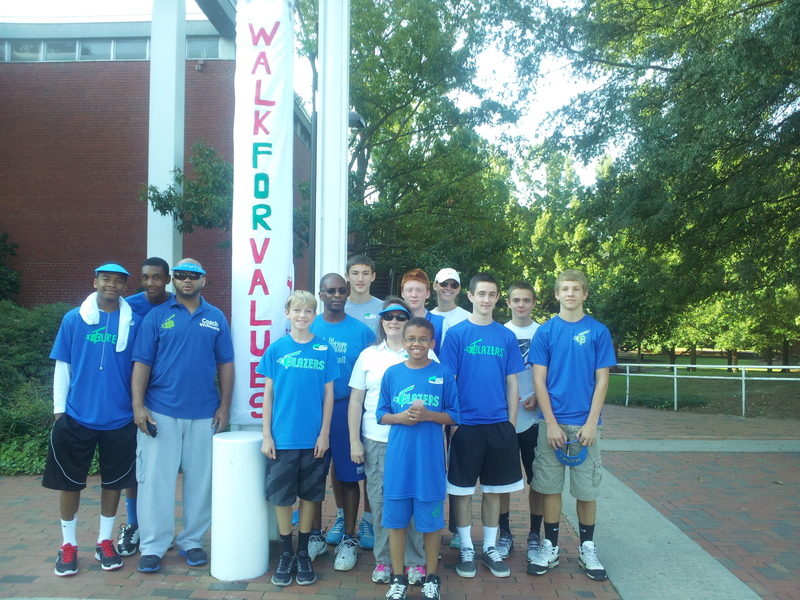 Pictured are some of the players and family members from the Triangle Blazers AAU Basketball program who took part in the 2012 Walk for Values at the NC State University Brickyard. The players and supporters attending represented many Triangle Blazers age group teams. Players from past U12, U13, U14, U15, and U16 teams were present. The Blazers chose to represent two values during the walk, Love and Truth. Coach Michael made a short speech to the crowd that told a brief summary of how the Triangle Blazers is more than just a basketball club – an organization that includes activities such as the Walk for Values and also about how we like basketball very much and use it as a way to express our positive values and teach our youth important life lessons. People attending the event had ethnic origins from all over the world, represented all ages, and walked together as a demonstration of shared values. The Triangle Blazers AAU Basketball club also has players, families, and supporters with ties to all the continents of the world. We also bring together the various age groups of youth players so that they can learn from each other but don’t limit it just to the players – we include family members from younger siblings to grandparents.